← Who You Calling ‘Foreign’? Yesterday, Marine Scotland published a controversial report on fish stocks in the Firth of Clyde as the Clyde Ecosystem Review. Whereas two years ago, a similar report had predicted that the estuary was “about to become a marine desert” this report is far more optimistic and talks about “a functioning ecosystem” and “more white fish biomass than in the 1940s“. “The Firth of Clyde has been a rich and productive fishing ground for Scottish fishermen for hundreds of years, however intensive fishing in the twentieth century has made an impact. Therefore it’s very encouraging that this new report reveals a remarkably resilient ecosystem, which has shown recent signs recovery and continues to support fish populations. All of which is good stuff. By surveying the fish actually in the sea, including the minnows and not just taking statistics from those that are caught, it is believed that this survey is much more accurate. A large number of young whiting is thought to be because their predators are being caught. The more informed and/or cynical among you out there reading this might be caught with a sotto voce “aye, right” on your lips right now. Because whitefish increase or no, landings are not what they once were and a whole variety of fishing methods (quite apart from the insanity of CFP-induced discards) are literally tearing the place up. Most at fault are the prawners and scallop dredgers. To catch prawns, you need fine mesh nets and just about everything else gets hoovered up as by-catch. The scallop boats drag what is effectively a marine bulldozer along the bottom. Not only does this bring up a different sort of by-catch as well as prawns but it’s like harvesting apples using low-level bombers: it gets the job done but leaves a wasteland. The Community of Arran Seabed Trust now has several years of a total take ban on a couple of square kilometers in Lamlash Bay and are pleased with the biodiversity gained but this is literally a drop in the ocean of the whole Clyde ecosystem. While water quality improvement and regulated fish and shellfish farming have certainly helped boost the productivity of Scotland’s inshore waters, increased seal and seabird populations, though welcomed, are often at odds with producers, much as sheep farmers oppose reintroduction of eagles or wolves because of what they may eat. Although there has been no equivalent study, the situation in the Forth appears similar to the Clyde. The exception here is the lack of fish farming—although if someone were to reintroduce the local oysters, once so plentiful they were the staple of Auld Reekie’s poor, there is a fortune to be made (they’re smaller but sweeter than the pacific variety in current use). But we have the same scallop and prawn boats, as well as a scattering of one -man inshore crab and lobster smacks all round the Forth’s many small harbours. Every time I go out on it, the Forth seems healthy too. Not only have cetaceans been spotted around its mouth (always a sign of good water quality) but the gannets of the Bass continue to thrive. Gannets aren’t too fussy about which fish they take, as long as they swim within 5m or so of the surface. These big birds can take fish a half kilo or more in weight. Last time we counted, 150,000 of them were living on the Bass. 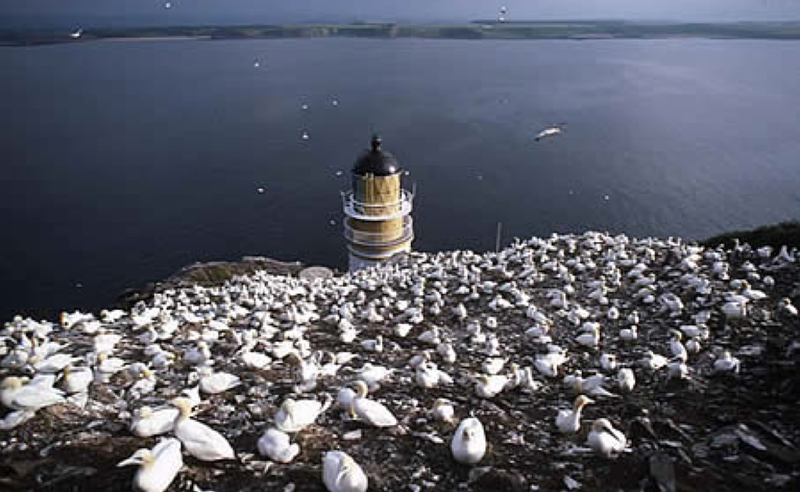 Even if they took just one fish per week each, that’s ten tonnes of fish a DAY going down gannet gullets alone. On the other hand, Bass gannets have been detected fishing as far away as Norway so it may be they are being forced to extend their range. For short-ranged seabirds like puffins and guillemots who ‘fly’ deep underwater to catch their prey and don’t have that option, the story is not so good. Puffins locally had been losing numbers while the Danes were sucking up thousands of tonnes of their staple sand eels off the Wee Bankie for use as fertiliser. Then they were hit by invasive Bass Mallow blanketing Craigleith and Fidra so they couldn’t even land, let alone get to their burrows. Numbers do seem to be rising again. But, while the puffins may be recovering, guillemots (in French “little penguins” because that’s what they look like) seem to be in decline. The massed colonies on Craigleith’s east cliff and the steep side of The Lamb have thinned. Just what that means is unclear but such birds feed on just those small fish most likely to get wheechled up in a prawn net and not seem big enough to bother throwing back. It is a similar story with the dainty kittiwakes who take smaller surface fish. We should learn lessons from elsewhere. Once people could pick the delicious California abalone along any rocky seashore. And, although that great state has 1,500km of seashore (15% of Scotland’s) the abalone is now fished out and endangered. Wildlife tourism is one of our growth industries. And while one of the glories of the Forth is its wildlife and its accessibility from the Capital, we should not be smug. I would not take Marine Scotland’s report as more than a reprieve that we have not messed up our inshore marine environment quite as badly as we thought. Business as usual is no sensible option. This entry was posted in Commerce, Environment. Bookmark the permalink.